Gaynor’s Performing Arts Center opened for students this week during an inaugural assembly to allow them to experience the theater. 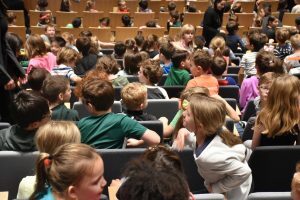 As students walked in, they were visibly excited, exclaiming “This is so cool,” and “Woah,” as they took in the space on the way to their seats. See highlights from the opening assemblies and a preview of the Performing Arts Center in the video below.